Between The Buried And Me are never ones to do things by halves, which is probably why they’re releasing TWO albums this year. The first of which, Automata I, is out today, and is a dense, sonic journey through their own dark imaginations. Here, bassist Dan Briggs goes deep into each track, examining and explaining how BTBAM orchestrate their own dreamy brand of progressive metal. “We close out the first half of the record with a song we original thought of as two tracks. The song seamlessly keeps the pulse of Gold Distance going, while taking away a beat every other phrase. I think we’ve used the electric sitar on every album since Parallax II, and this seemed like an obvious first place to drop it in. I love the way Tommy approached the verse at 1:25; the part has the heavy octave pedal 9⁄4 droning rhythm, but he finds a great way to interject melody over it. The Coma record was big for him seeing parts from a few different angles, I think. The chorus is a part that I believe Paul wrote near the end of the Coma sessions, I remembered always hearing it on acoustic and it was rad to hear it come to life. Also one of the more busy sections on the album with rhythm guitars, bass arpeggios, layered vocals, choir, a spaced out delay lead and a barrage of 16th note toms and cymbals in the back half… good on our mix engineer Jens Bogren for making sense of it! Between The Buried And Me’s new album Automata I is out now – order your copy here. 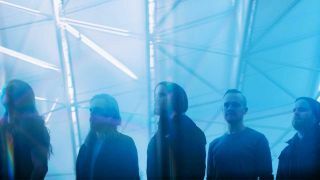 In the new issue of Metal Hammer, Between The Buried And Me reveal the dystopian, sci-fi themes that feed into Automata I. Buy it directly here or become a TeamRock+ member to read it right now.